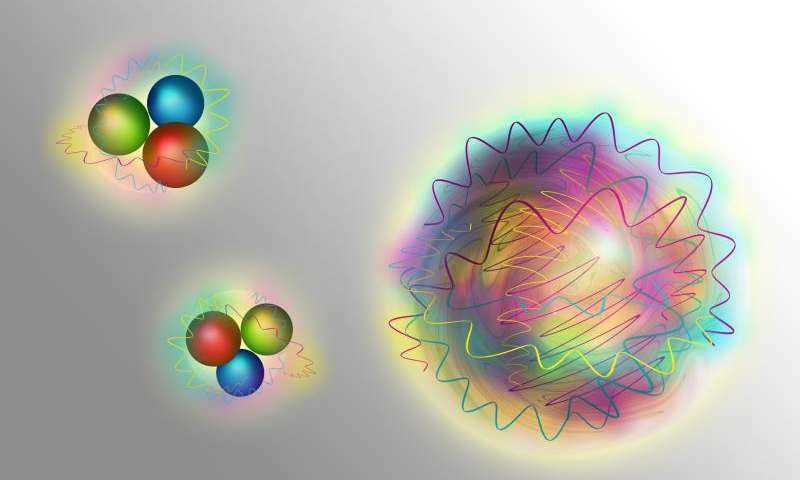 After decades of searching, researchers believe they have finally discovered a glueball – a proposed particle that consists solely of gluon particles, without valence quarks, that is instrumental to the Standard Model of Physics, but hasn’t been observed until now. Nucleons consist (left) of quarks (matter particles) and gluons (force particles). A glueball (right) is made up purely of gluons. Image via Physorg. There are four forces governing the basic interactions of particles – these are called the fundamental forces: gravity, electromagnetic, weak nuclear and strong nuclear. All the interactions in the universe can be described by some combination of these forces. Now, in 1970, physicists tried to write down how these forces interact with each other at the subatomic level, and predicted all the particles that they believe make up the universe. The current formulation was finalized in the mid-1970s upon experimental confirmation and since then, further experiments have confirmed the validity of the Standard Model. According to the model, protons and neutrons are made of minuscule elementary particles called quarks. These quarks are held together by even smaller particles, gluons. Gluons are massless particles somewhat similar to photons – just like photons are responsible for exerting the electromagnetic force, gluons are responsible for exerting the strong nuclear force. In a way, they are strong nuclear force. “In particle physics, every force is mediated by a special kind of force particle, and the force particle of the strong nuclear force is the gluon,” explains one of the researchers, Anton Rebhan from the Vienna University of Technology. But there is one major difference: while photons aren’t affected by the force they exert, gluons are. In other words, gluons can’t be held together by strong nuclear force, but they can do exert strong magnetic force on other particles; that’s just how the strange world of particle physics sometimes works. However, while glueballs are massless on their own, their interactions with other glueballs does give them a mass, which means that scientists can theoretically detect them, albeit indirectly, through their disintegration process, but that’s extremely difficult because in particle accelerators, glueballs tend to mix with other particles (namely meson states). However, Rebhan and his team published a report in Physical Review Letters which gives a lot of hope for detecting these particles. “Our calculations show that it is indeed possible for glueballs to decay predominantly into strange quarks,” he says. They will now analyze more data from the Large Hadron Collider at CERN (TOTEM and LHCb) in Switzerland and an accelerator experiment in Beijing (BESIII) to help confirm their find.